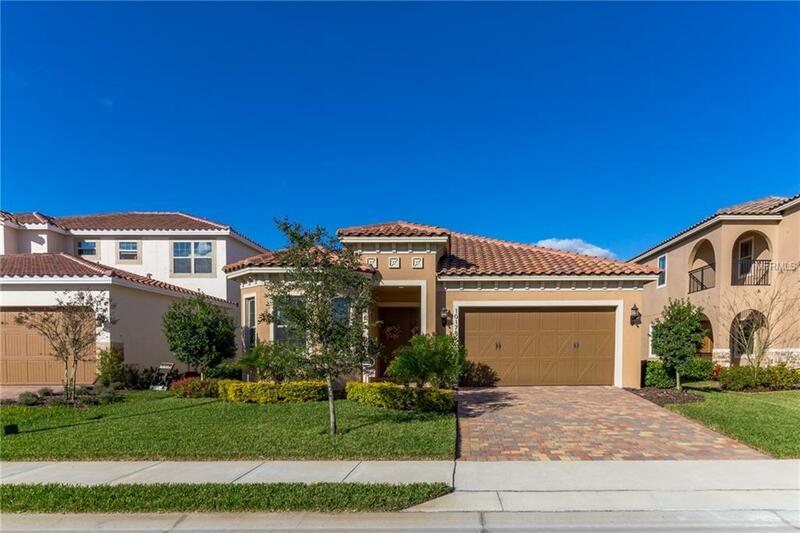 STUNNING MEDITERRANEAN ONE STORY HOME IN MAN-GUARDED GATED & GOLF COMMUNITY NEAR LAKE NONA MEDICAL CITY! Tiled roof, brick paved driveway, & beautiful landscaping welcome you to this beautiful like new home. The centrally located kitchen is highlighted w/ 42 Expresso Cabinets, quartz countertops w/ eased edge, large island, & stainless steel appliances. Relax in the owner retreat the perfect place to unwind featuring an oversized master bedroom w/ massive walk in closet, trey ceiling, garden tub, large walk in shower & dual vanities covered w/ Caledonia granite with a makeup vanity in the master bath. Glass pendants, Caledonia granite counters in the bathrooms, glass backsplash, wood look porcelain tile in common areas, decorative lighting, blinds, window treatments, recessed lighting & marquis glass lisetto provide the touches of elegance to this masterpiece. Walk out beautiful French doors to enjoy outdoor Florida living under the covered lanai that runs the length of the house. Rod Iron fencing encloses the low maintenance backyard. Have a peace of mind knowing this home is zoned for top rated Lake Nona schools & PROTECTED w/1 YR HOME WARRANTY! Eagle Creek is loaded w/ amenities: 24 HR Security, playgrounds, community pool, recreation center, 4 tennis courts, 2 basketball courts, splash park, dog park, fitness center, & public golf course. Conveniently positioned across the street from Lake Nona Medical City, 25 mins to Downtown Orlando, 30 mins to Disney, and 45 mins from Atlantic Ocean Beaches.